I unfortunately have had to cancel my concert engagements for the time being after my doctors advised me to take a complete rest, in order to fully recuperate from exhaustion caused by over-work. I really look forward to resuming my performances as soon as I have 'recharged my batteries'! In the movie (and trailer) Paul Popma, the marketing manager of Universal Music told he made a deal with an important newspaper for an interview with Janine from 2 pages and asked : "Janine, don't you think we are too exploitative. Sometimes I wonder." 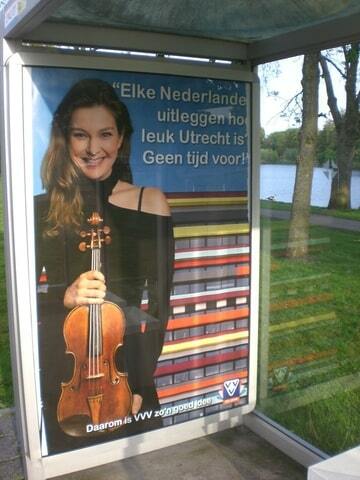 It is a good pr action after the glossy "Janine" and the poster of the Tourist information in a busstop. Next to an evergreen Claire de lune, also 3 unknown pieces of the composer Dubugnon (1968). I had wondered about this. I wish her a very restful break, and then a reasonable schedule thereafter -- perhaps a plan with both give and take.